This project aimed to build an understanding of mineralization at Lara and Mount Washington by analyzing soil, plant and snow samples in the area. It also aimed to improve the commercially-available process for analysing samples. Low-impact and effective methods for identifying mineral deposits help the minerals and mining industry to reduce the impact of exploration activity. They can also lower costs and increase efficiency of mineral exploration. This project helps to verify previous data from two sites while also helping to develop new and innovative technologies for future commercial use. Broaden the range of sample media used at two sites to identify potential mineral deposits. 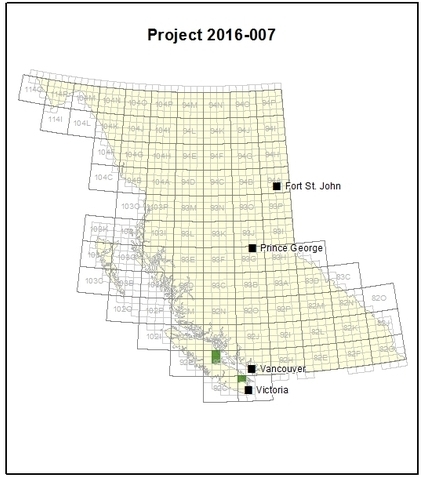 The innovative methods used in this study will help to develop new and low impact ways of identifying potential mineral deposits in British Columbia and beyond. The Lara site is in Cowichan and Halalt territory approximately 25 kilometres southwest of Chemainus and 75 kilometres north of Victoria on Vancouver Island. Access to the site is by existing logging and drilling roads, and by BC Hydro right-of-way. The presence of halogen elements (fluorine, chlorine, bromine and iodine) in soil, plant and snow samples can indicate the possibility of minerals below the ground. At Lara, samples of the predominant tree species – Douglas-fir, western hemlock and western redcedar were collected, along with soil samples taken from the same location. At some sites samples of understorey species (plants that below beneath the forest canopy) — such as Western sword fern — were also collected. At Mount Washington 18 passive ion collectors were installed, along with samples of foliage and fluids from mountain hemlock at some locations. Snow samples were also collected and analyzed. This project demonstrates that sampling and analyzing halogen elements can be an effective new tool when exploring for buried mineral deposits. It also highlights the appropriate sample type and analytical methods to use. However, these are specific to one forest type and surficial environment and do not encompass all potential environments in BC. More work is therefore needed to optimize sample types in other common forest types such as the spruce, lodgepole pine or Douglas-fir forests of the Interior. Further development of the analytical methods is important if halogen elements are to become widely used by the mineral exploration community.